Vinicius was born on October 2, 2009 out of sheer joy at the decision of hosting the 2016 Summer Olympics in Brazil. 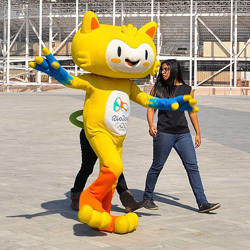 This Olympic Games mascot is a perfect blend of all Brazilian animals as he has the “agility of cats” and “the grace of birds.” The main mission of Vinicius is to spread joy around the world and celebrate friendship between people from all over the world. The 2016 Rio Olympics will see Vinicius entertain spectators with all the best things that the Brazilian animals can do. Mascots help build excitement around an event and are representatives of the games. The Rio de Janeiro Summer Olympics has two official mascots – Vinicius and Tom – whose names were decided by a public vote. The results of the vote, which were released in December 14, 2014, saw Vinicius and Tom winning over two other sets of names, which include Oba and Eba and Tiba Tuque and Esquindim. In the words of Brand Director Beth Lula, the two mascots are intended to reflect the diversity of the culture of Brazil. The Olympics mascot Vinicius, which represents Brazilian wildlife, is named after musician Vinicius de Moraes. The Paralympics mascot Tom, which represents the plants of Brazilian forests, is named after musician Tom Jobim. Since the first mascot in Olympics history made its appearance at the 1972 Munich Olympic Games, Mascots have become an important element of the Olympics' image. As a popular image of vitality, a mascot manifests the Olympics' spirit, communicates the concepts of each Olympic Games, promotes the history and culture of the host city and creates a festive atmosphere for the games. Mascots act as a vehicle for expressing the Olympics spirit to the general public, especially children. Whatever shapes they have, mascots must be able to convey the theme of the Olympic Games, showcase the distinctive features of the host city. 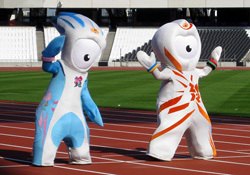 The mascots for the London Olympics 2012 were Wenlock and Mandeville. Wenlock's name was inspired by the Wenlock Olympian Society, an annual Olympic event held in Wenlock, England. Mandeville took his name from the Stoke Mandeville Games. Wenlock wore five bracelets in the five Olympic ring colors. The three points on his head symbolized the three podiums of the winners (for first, second, and third place), the shape of his head was same as the Olympic stadium, and on his body the logo of the game was printed. Mandeville wore a pink watch set to 0:20:12, and on his head there were three points in red, blue, and green representing the agitos, which is the symbol of paralympic games. 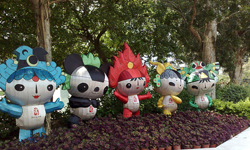 The 2008 Beijing Summer Games Mascots were Fuwa, means "Good luck dolls." The Fuwa were designed by Han Meilin and released on November 11, 2005 at an event that marked the 1000th day before the opening ceremony of the 2008 Olympics. The National Society of Chinese Classic Literature Studies made the presentation. Olympic mascots are usually two or more animal figures or characters from the host country. The Fuwa comprises five members, representing the five traditional Chinese elements that include Beibei, Jingjing, Huanhuan, Yingying, and Nini. Each of these five names sounds like a child's name, but when put together, they sound like a phrase meaning,"Beijing welcomes you." The five figures comprising the 2008 Beijing Summer Games Mascots also represented the Olympic Rings. The Athens Olympic Mascots, Athena and Phevos, with their wide feet, long necks and tiny heads, one in orange and the other in deep blue, are based on dolls, thousands of years old, found at archaeological sites in Greece. Greek mythology had it that Phevos and Athena are brother and sister, named after two Greek gods: Phevos, the god of light and music, and Athena, goddess of wisdom and patron of the city of Athens. Syd, Olly and Millie, designed by Matthew Hattan, are three native Australian animals chosen as mascots for the Sydney 2000 Games. They represent earth, air, and water. Olly, a name derived from "Olympic," is a kookaburra that epitomizes the Olympic spirit of generosity and universal generosity; Syd, derived from the Australian capital, Sydney, is a platypus that represents the environment and captures the vigor and energy of Australia and its people; Millie, symbolizing the millennium, is an echidna, a technology whiz and information guru, with all the facts and figures at her fingertips. Izzy, the mascot of the 1996 Olympic Summer Games in Atlanta, was the first mascot designed on a computer. Izzy is an amorphous abstract fantasy figure whose name was derived from the question,"What is it?" because no one knew exactly what Izzy was. Barcelona 1992 Summer Olympics Mascots: Cobi The mascot of the Barcelona Olympics was a dog named Cobi. The Barcelona Olympic Organizing Committee had specially produced a TV series for Cobi to portray the spirit of the games. The Valencian artist, Javier Mariscal, created the dog Cobi as the official mascot of the 1992 Barcelona Olympic Games. For the 1988 Olympic Games, held in Seoul, Korea, a small tiger designed by Kim Hyun was chosen as the mascot and named Hodori. Hodori was designed as an amicable tiger that portrayed the friendly and hospitable traditions of Koreans. Ho is derived from the Korean word for tiger, and Dori is a diminutive for boys in Korea. The friendly tiger of Seoul wore the Olympic Rings around its neck, much like a medal, while sporting a traditional Korean dance hat on its head. 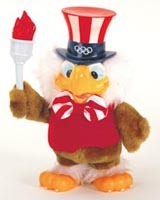 Designed by Walt Disney, Sam is a cartoon eagle dressed in the style of the legendary Uncle Sam, with a star-spangled background in red, white, and blue, the national colors of the United States. Commercial use of Olympic mascots was initiated at this point. The Moscow Olympic mascot, Misha, was a bear, developed by the renowned illustrator of children's books Victor Chizikov. Misha became an instant international success. Montreal's mascot, Amik, was a beaver named for the Algonquian word for beaver, the national animal of Canada. Algonquian is the most commonly spoken language amongst Native Americans in Canada. The beaver symbolizes hard work. Waldi, the dachshund, was the mascot of the 1972 Munich Olympics. Very popular in Bavaria, Waldi also possesses qualities that are indispensable to an athlete: resistance, tenacity, and agility. These are among the reasons he was chosen to be the mascot. Waldi was dressed in pastel colors to express the gaiety and joy of the Olympic festival.